Over the week since Apple announced its own maps solution for the iPhone and iPad, a lot of attention has been given to the fact that, at least for now, it won’t include public transit directions. There have been a lot of complaints and commentary, but I don’t think that the reasons have been addressed clearly, so I talked to some smart people in the mapping industry and came up with a few answers. Apple isn’t including public transit directions as an option for users of its new Maps app in iOS 6. These directions, which are included in the current iOS 5 Google-powered version of the app, are incredibly important to urban dwellers, as explained by our own Drew Olanoff. Instead, Apple says that it will provide a section that highlights the best transit apps for any given local area, which will be targeted through App Store categories and location data. 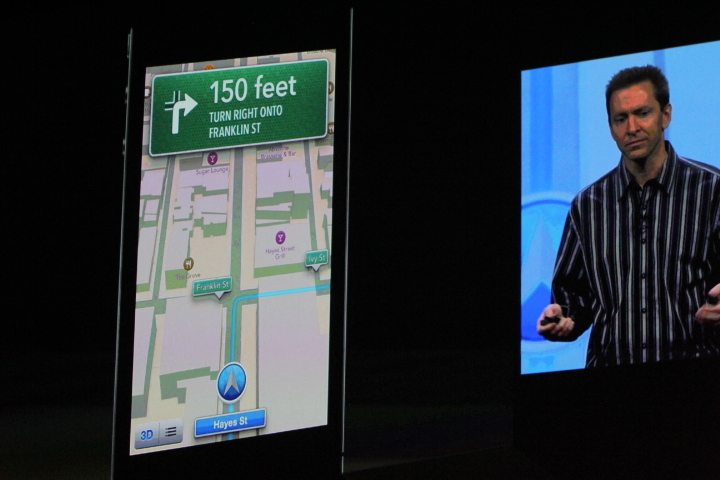 This section will be displayed right within the Maps app itself. This isn’t the only feature that Apple has left out of the Maps beta either, as it currently doesn’t support a street view feature, another Google staple. But why were transit directions omitted for the beta, and when might we see a native feature and what is the deal with Apple saying that ‘developers can do it better than us anyway’? The data for these transit directions isn’t as easy to come by as you might think. There are usually a variety of different sources for the data of any group of given cities. Many municipalities may make it publicly available for access to companies like Google, Apple or individual developers. Some others publish the data but put forth no special effort to make it accessible to mapping companies. There are some areas where the data has to be negotiated or gathered manually when schedules are changed. It’s safe to say that most major cities have this data made easily available, but the big picture is that there is no simple faucet of data that companies like Apple and Google, or independent developers for that matter, can hook up to in order to populate their apps with transit data. It’s a complex operation that takes time and effort. In fact, it’s so complex that Google still doesn’t offer transit data in all cities and areas. This is especially present in many areas outside of the US, where transit directions have never been available through the maps app on iOS. Is Apple Biding its Time? The complexity of this data gathering raises a question: is Apple simply buying time to build its own transit database that will allow it to offer its own service at the launch of iOS 6? This is one of the theories I’ve been hearing raised, and it just makes no sense. Remember, Apple has said it will feature these apps for customers in iOS 6. In true form, many sites have taken to treating this early beta of the Maps app as entirely complete and have begun picking it apart. But you have to remember that this won’t ship until ‘the fall’, likely along with a new iPhone. So, when Apple says that it will display the apps in a special section, why would it only do so during a period that is supposed to be strictly for developer testing? At this point, with the information we have now, it seems clear that the Maps app will launch with the ‘recommended transit apps’ section in iOS 6. One thing that is pretty evident at this point is that, while an individual developer’s app may provide a superior transit experience in a local area, it will be less convenient to switch to it and use it than just tapping the ‘transit’ button. Is the trade-off worth it? I don’t know, perhaps in those areas which had poor or no transit data before. This user experience hit means that it is potentially likely that Apple will take the reigns of transit directions and include them in the Maps app of a future version of iOS. But it won’t be the initial release of iOS 6 and, frankly, I wouldn’t count on it for some time yet. The mapping folks and developers that I spoke to all saw this development as a positive one. As mentioned before, Google’s transit data wasn’t perfect, and there were areas where it was nonexistent altogether. There are half a dozen or more decent Muni apps for the San Francisco area, but other cities may have fewer or no options yet. For those cities that never had transit data in Google’s services, there is an opportunity for developers to source that data and create their own app to serve the customers locally. For those cities that have a bunch of transit apps already, this provides an opportunity to create a ‘best-in-class’ experience. In the end, it’s likely that the transit apps for your area will get better as developers compete and you may end up with one or more options for those directions where there was previously none. Apple just introduced Maps this week, and, because it’s an exciting development in the war against Google, it’s going to get examined with a fine tooth comb. There are a lot of questions that will get asked and answered over the next few weeks, I’m sure. But, when it comes to transit directions, just chill out. In all likelihood you’ll end up with a transit option that is as good or better than what Google Maps gave you on iOS in the first place.